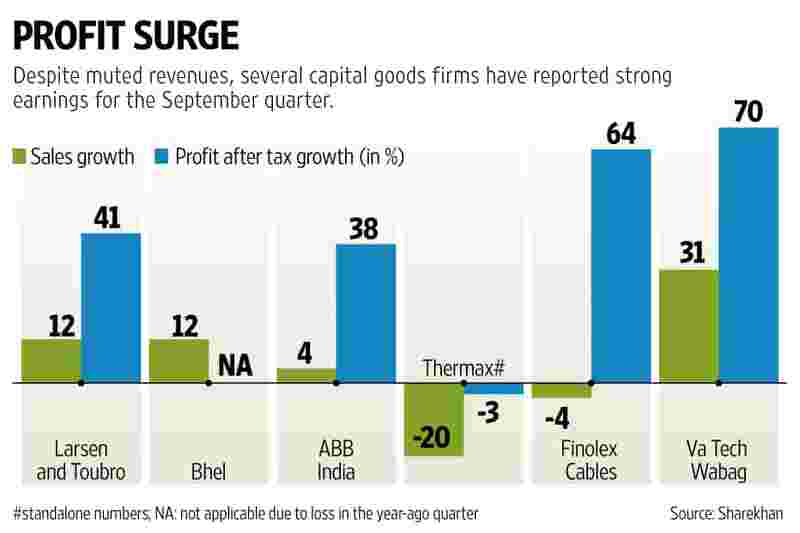 Given the weak investment climate, capital goods companies delivered a decent performance in the September quarter. Capital goods companies delivered strong earnings in the September quarter. Aggregate revenues of the capital goods firms in the BSE Sensex grew 8%. But net profit of the same set grew by an impressive 32.7%, data compiled by ICICI Securities Ltd show. The performance was led by industry bigwigs Larsen and Toubro Ltd (L&T) and Bharat Heavy Electricals Ltd (Bhel). L&T reported stable margins while Bhel surprised the Street with a strong operating profit. It reported a loss in the year-ago quarter. Among the second-rung companies, the story is slightly different. Product companies Bharat Electronics Ltd and VA Tech Wabag Ltd registered strong revenue growth. But performance on the earnings front was mixed due to weak sales and adverse market conditions. “Ex-Bhel, the operating profit of our coverage universe grew 9% y-o-y (year-on-year). Among the rest, most companies like Finolex Cables, Skipper, V-Guard Industries and Va Tech Wabag delivered a very healthy operational performance (ranging from 25-45% growth). However, Thermax and Triveni Turbine reported a soft operational performance," securities house Sharekhan Ltd said in a note. “Thermax’s operational performance was adversely impacted due to weak top line, while Triveni Turbine reported flat operating profit due to subdued after-market sales." Overall, given the weak investment climate, capital goods companies delivered a decent performance in the September quarter. Order inflow trends remain mixed. While L&T reported a healthy 11% rise, order inflows at Bhel have seen a sharp dip. Relatively smaller firms ABB India Ltd, Thermax Ltd and VA Tech Wabag reported strong order inflows. But the trends (strong order inflows) are not broad-based yet, even though the order backlog remains strong for most firms. L&T maintained its full-year forecast of 15% growth in order inflows and 12-15% rise in revenue but said business conditions remain challenging. Bhel warned some of the existing orders in its backlog may be cancelled. While the commentary remains cautious, the recent demonetisation of high-value notes is adding to the uncertainty. Analysts fear the liquidity crunch can weigh on execution and on earnings of companies in the rest of the fiscal year and this is weighing on share prices of the companies. “The product-based B2C (business-to-consumer) companies are likely to get impacted directly amid a slump in demand and could take some time to see recovery in demand. On the other hand, the projects-based B2B (business-to-business) companies are expected to get indirectly impacted, like slower project execution or expansion in working capital requirement for some time. Therefore, we expect a weaker H2FY17 for our coverage universe," Sharekhan added.